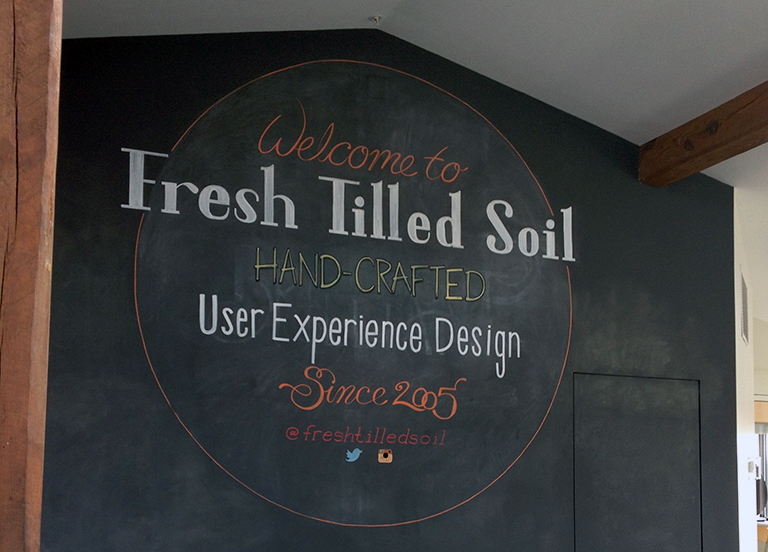 This past Thursday, Fresh Tilled Soil held an event called Experience:Dev for the first time. The event focused on a closer look at development and UX practices, running teams of developers, and different approaches and dynamics in this field. I attended the conference with a web developer, and found it interesting to be able to compare our experiences and thoughts in between each talk. I was super inspired by all of the talks at this event. I found that the speakers reminded me of major topics in the field, and brought new ideas of company culture, managing remote or local teams, and the importance of communication between teams to the table. I took a few notes but mostly tried to listen and absorb all of the knowledge, and want to use these ideas to inspire the way I work in the future. Collective action and energy is important. When someone puts something out there, they need something back – feedback or acknowledgement of any sort. This keeps the energy flowing. Find a way to help distributed teams have a local impact, and to feel a part of a team – regardless of time zone or work hours. Structure helps set guidelines so teams can develop and grow further, without wondering how or where they can do so. Set up a good structure, and great things will happen. Culture is not something you can create in an organization, but you can nurture it and provide a place for it to happen. Experiment with culture games. This panel was absolutely fantastic! It featured six founders, presiders, and presidents of marketing/product agencies and startups. The questions and discussions ranged from how do you find a good personality fit for your team, what if you have a “bad apple” on your team, how do you hire, do you hire A players always over juniors, and more. I learned a lot and was so engaged that I didn’t even take notes! Splitting hairs over pixel perfect designs can still land designs at the wrong decision or solution. Designs are only a best approximation of solving a client’s problem. I really appreciated this event from the perspective of being a project manager, but also having a background in design and general interest in how people communicate on teams and how to better facilitate this. I’m excited to use my new perspective on everything from these talks and to start some new initiatives I’ve been thinking on. This event really pushed my thinking forward out of a rut, and I’m looking forward to what might be in store the next few months!